We are pleased to announce the opening of our distribution center in the United States. Overseas customers could buy all our Firefly products in our official Amazon Store.The transport time would be much efficient. Thank you for your continuous supports. Do you plan to make available the Fireprime thru this channel? And what about the Firefly 4GB/32GB model? Visited the Amazon Firefly store, the prices are 30~45% to high. The product descriptions leave out too much information. $69 for 13mp camera while RPI 13mp camera is $25? 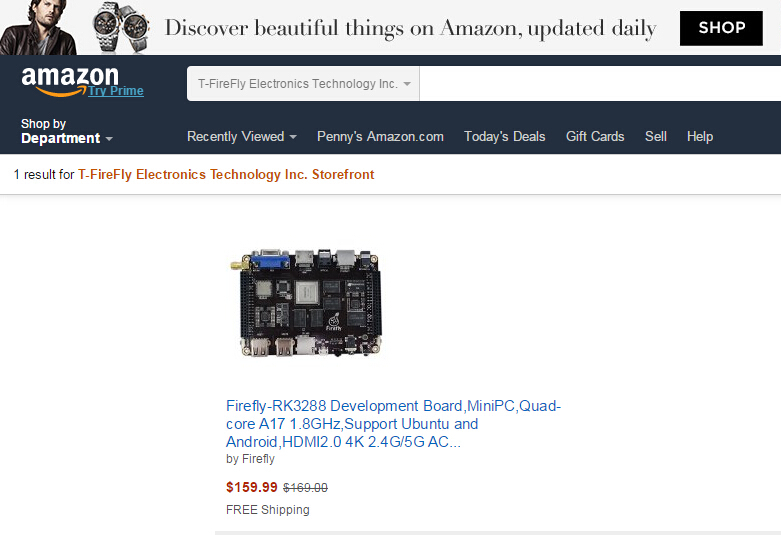 When will the Firefly-RK3399 Plus 4gb + 32gb and the Firefly-RK3399 Max 4gb 128 gb boards be available in sufficient numbers internationally, especially on Amazon? And why us there no mention of most the the Smartfly accessories, especially the PCIe M.2 to SATA adapter boards? The only place you can source this crucial bit of kit is on Aliexpress. Visibility on the primary Western online stores such as Amazon and Ebay. If you indicate you are out of stock, it is only good business practise to mention why and what the ETA for new stock is going to be. Full complement of accessories indicated on Amazon and Ebay. On Amazon you show photographs of the Firefly RK3399 with a hard drive in the acrylic enclosure, yet your PCIe M2 to SATA adapter is not mentioned at all. The only accessory I came across is the OV13850 Camera Module. Yes I'd steer away from the FireFly on Amazon - the prices are misleading (several different ones for the same units - but with different delivery dates from China). So why pay so much more for the product if it isn't shipping from the local Amazon? It's probably being run by the cousin or younger brother of the dudes in China and he wants to by a sports car to look cool to his buddies, so he jacked up the price [ chuckle ]. Luckily I found a site based in the US who had some 2GB versions in stock.